Why Do I Review Webcams? 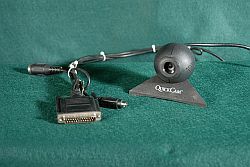 I purchased and setup my first webcam in early 1997 while volunteering at Manassas National Battlefield Park in Virginia. I placed that camera on top of the monitor in my office. As I played with that first entry level camera, I concluded I really wanted something better, so I purchased the more expensive model and pointed it out a window in the Park's Visitor Center. 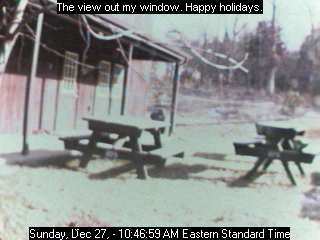 To the best of my knowledge, that was the first publicly available webcam in any National Park anywhere in the world. That camera ran for about a year before it was removed. As the cameras continued to improve, I kept upgrading, trying to find the one that gave the best picture. In 1997 we only had four or five models to chose from. By 2002 that number had increased substantially and I became frustrated by the lack of useful information on the product boxes and in Internet reviews. Most of the reviews described the features of the software, not the cameras. When it came to the performance of any given model, the reviews were sorely lacking; in fact, reliable performance data was totally non-existent. There was no way to determine which make or model produced a better quality image without buying all of them, which is what I ended up doing over time. If one were to go just by the information on the boxes, all the earliest cameras would have been exactly the same. In most cases, the boxes concentrated on what you could do with their camera, rather than the actual specifications of their product. It seemed like the manufacturers were trying to avoid indicating one model was not as good as another, leaving the buyer confused and dismayed. Why buy a $150 camera when the box indicated you could do the same stuff with the $50 model? I'm happy to report that, in some cases, newer cameras do give you a better idea of product specifications, but to the uninformed, they can still be difficult to understand or easily deceptive. One day in late 2002, I was standing in front of the webcam shelf in my favorite computer store. While debating which new camera to buy that day, the thought suddenly came to me to create a web page about my experiences. It was instantly clear that I should include some kind of standardized tests showing how each camera performed. At that time I had about 7 or 8 different cameras. I spent several days deciding what kind of tests I could design that would cover the most common situations. That developed into my six basic lighting types. Three days later the webcam section of my site was born. Over the next couple of years I refined the test setups so they could be reproduced fairly easily. I even took the shirt I was wearing in my first tests, and put it away to be used only for webcam testing. I only put it on for the short period required for testing, so it doesn't have to be washed very often. This reduces the wear on the shirt and keeps fading to a minimum. What you can do with your camera is dependent on the software installed. Most of the cameras include the same basic software, with minor variations to make the manufacture's product unique. Many of the earlier cameras included software to subscription services which went out of business within a year. Many of the newer cameras include cute gimmick-type applications, such as turning your head into an animal, or overlaying cartoon flowers in front of the picture. I suspect the kids love these, but they have little to do with how well the camera performs. I use none of the software applications that came with my cameras, most of which seem to be designed to sell the camera or to get you to upgrade to a premium package. Most of the software portion of my reviews concentrate on the drivers that you have to use to make the camera's work, not the added applications bundled with the cameras. So here are my reviews of the cameras I have purchased over the years and have used as webcams. I hope you find them useful.